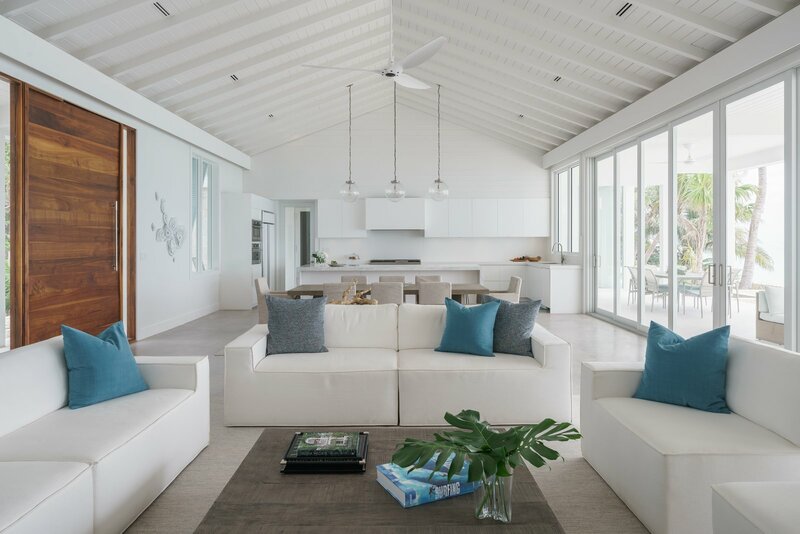 Appropriately named, “Out of the Blue,” this stunning residence located on the island community of Cat Cay seeks inspiration from the amazing hues of blue that reflect off the surrounding ocean. Designed by Touzet Studio, this project combines both form and function to create a visually stunning property that is built to withstand the tropical environment. The construction of the house was inspired by Bahamian architecture with modern flair. This design incorporates Bahamian shutters, porches, breezeways, native keystone, and ceilings with wood cladding – all elements characteristic of Caribbean architecture. The goal was to highlight the ocean and offer a peaceful retreat where one can relax and truly enjoy the surrounding tropics. A gorgeous infinity pool and simple, concrete decks perched above the rocky coast below make the transition between indoor and outdoor seamless. The sliding doors in the “great room” also retract to allow for magnificent, uninterrupted ocean views. The Miami-based firm designed this home with sustainability in mind in order to moderate energy use and consumption. Large shady porches, volume ceilings, smart window placements and an open-air breezeway permit hot air to rise, allowing for great cross-ventilation throughout the home. This reduces the need for air conditioning and lowers other energy costs. Large floor-to-ceiling, energy-efficient windows make artificial light during the day unnecessary. The firm also incorporated rainwater harvesting, complete with large cisterns below the home and gutters on all the roofs. Grey water is also recycled for irrigation, plumbing and other non-potable uses. The private home is located on the exclusive community of Cat Cay and is nearly 4,775 SF AC space, not including the basement.